In 1976, legendary singer and songwriter John Lennon applied for permanent residence in the United States at a police department in Manhattan, New York. Shortly after that, the card disappeared, stolen from the records by some sort of overzealous fan of The Beatles. 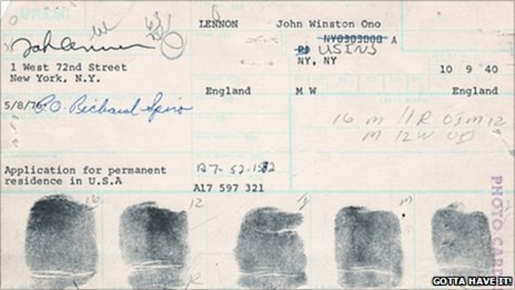 Now, John Lennon’s fingerprint card has emerged from hiding at an auction to honor the 70th anniversary of Lennon’s birth, but the planned $100,000 auction won’t go off as planned. The FBI came to the offices of Gotta Have It!, the company running the auction, and took John Lennon’s fingerprint card. The card was one of 850 pieces of memorabilia to be auctioned off in honor of Lennon’s rock and roll legacy.